Here's all the recipes listed under Healthy Crepes along with the comments posted by the breakfast lovers that submitted them. "These are great for breakfast or any meal. Takes only 10 minutes to make. No gluten. No problem. 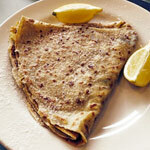 They're just as good as crepes made with all-purpose flour." 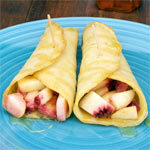 "This recipe uses a tortilla in place of a traditional crepe - super easy and fun for kids. Use low-fat tortillas and no-fat cottage cheese and it's pretty healthy too." "For best results, let this batter rest in the refrigerator for at least an hour before making the crepes." "This recipe uses Teff flour which has a nutty flavor that works really well with chocolate." 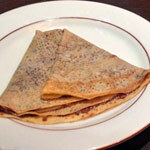 "Only four ingredient are required to make these gluten-free crepes. Especially good with sweet toppings or fillings." "Honey is a great alternative to sugar. It's sweeter and so less is required to effectively sweeten recipes." "I used a homemade orange marmalade my sister sent me for Christmas. These couldn't have tasted any better with less healthy ingredients. What a treat!" 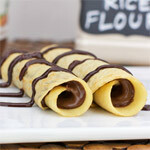 "These crepes can be frozen and served later. Just let them cool before storing in an air-tight container. 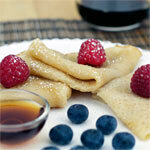 Use wax paper between the crepes to prevent sticking." "You can add your favorite sweet or fruity filling or just serve with lemon juice and powdered sugar like they do in Europe. I'm a fan a strawberry jam myself." "If I'm in a hurry, but still want to make something that looks impressive - I just fill these with jam or applesauce and top with a little puff of whipped cream. 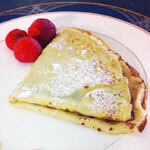 This recipe make 10 crepes."